The BBC has just reported on quite a big rise in use of the airports around the highlands and islands - 57% since 2000/2001. This is of course pretty good news for folk living in these areas because the cost of flying is likely to come down with greater use. The Scottish executive has made quite a lot of effort to make flying from Scotland's main airports to the highlands and islands easier and cheaper for residents. This is a massive help for those trying to run businesses from remote areas. The main initiative has been the air discount scheme which gives residents a 40% discount on airfares between Aberdeen, Glasgow, Edinburgh, Benbecula, Inverness, Islay, Kirkwall, Stornoway, Sumburgh and Wick airpoorts. It's funny how despite just about everything can be found on the internet these days but it still seems to take bloody ages any time you want to actually find it. So I've been trying to find ways to help folk find easier ways to get to the type of information they are after when visiting Highland Move. I will have more time over the summer to work on my websites and want to improve all aspects of them. It’s a bummer that I’ve not been able to update this blog much in the past few months, but I’ll shortly begin regular news and update post again – promise! One of the things I’ve been doing is using an Amazon feature to create my own ‘bookstore’ to help you find good books related to moving to the Highlands quickly. Click on the link to have a look. In the future you can find it on the sidebar of this blog. I’ll keep it regularly updated and try to get reviews up of new books that come on-stream. It an Amazon based thing, so you can buy any books straight from the shops if you like them. I thought it might be handy as it saves you searching through reams of pages and wondering which books are most up to date or highest quality. The BBC report that the National trust for Scotland are looking for 2 families to rent its properties on Canna and help stop the population fall any further than its present 15 residents (!). Apparently there is some opportunity to work "for those with building, gardening, electrics or plumbing skills". The pictured house certainly looks lovely. 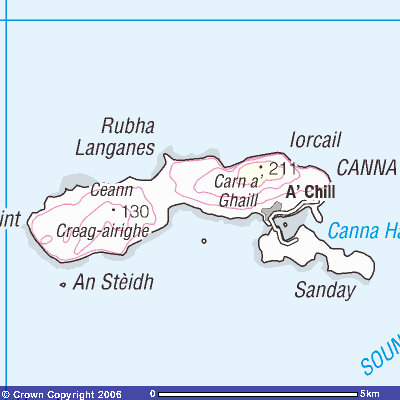 Although there are only 15 residents, Canna has 30,00 visits a year. The island was sold to the NTS in 1981 by Dr John Lorne Campbell who had himself bought it in 1938 for £9000. It was sold to them on the understanding that they would support the tiny community and not allow the island to become an unpopulated tourist attraction. It's good to see them keeping their word. Eco-build and renovation: Meet the experts. November 29th, Adelaide's 209 Bath St, Glasgow. 7.30pm. All the events are free. For more information check out the website. Next up in Highland Move's series of interviews is Kenneth Ross who moved from Edinburgh up to Ullapool in the far North West of the Highlands. People tend to choose the west coast of Scotland rather than the east for a love of it's rugged landscape and mountains. So choosing the right area for you often means striking a balance between availability of jobs an property in the bigger towns like Oban and Fort William with having the quiet and rural feel of smaller villages dotted up and down the sea lochs. I asked Kenneth wher Ullapool lies on this balance and why it was right for him. HM: Where did you live before Ullapool and what made you move there? Were you looking for places in the NW or highlands in general or was it something specific about Ullapool? Before moving to Ullapool I lived in Edinburgh for quite a while and although that it was great at the time I eventually became disheartened with the city; the noise, the traffic, having to spend 2-3 hours in the car to get anywhere. A long time ago I’d had a summer job in Ullapool and it had always been in the back of my mind to move there permanently. For me Ullapool had the right balance between isolation and services. I didn’t want to drive for half-an-hour to buy a pint of milk or have to commute to work. Lochaber was another possibility, but it can still get pretty busy during the summer down there and the weather can be awfully wet! The weather in the far North West isn’t as bad as people think and Ullapool probably gets less rain than Glasgow. Lastly, really like living by the sea. HM: What are the best things about living in Ullapool and it's surrounding area? The best thing is definitely the ease of access to fantastic wild countryside. Just being able to look out your window to check the weather, then go and do things locally is wonderful. Living in the country makes you more aware of the changing seasons and I like that. There is a much slower pace of life in the village and people just have more time for each other. There is also a sense of trust and community which is absent from the city. HM: Do you find it a welcoming place and have you made friends with many of your neighbours? On the whole people are friendly, certainly a lot more so than in the city. When I moved to Ullapool it was the middle of summer and busy with tourists and seasonal workers. A new face just didn’t stand out and it was only when things quietened down that I found it easy to make new friends. The population is approximately half locals and half incomers, and the locals can appear to be pretty cautious of outsiders. I’d say most of the people I’ve become friends with are incomers like myself. HM: Do you work in Ullapool itself? What are the main options for work in the area? Do you know people who live in Ullapool but work in Inverness or elsewhere? Do you find most people work in a narrow range of jobs or do you know lots of people who do many different things? Most options for jobs in Ullapool are tourist based. The main season is May to October when there’s lots a jobs in hotels and shops, and I’ve ended up working in various shops. Some people work in the rapidly declining fishing industry or offshore. Many people have more than one job so they can earn as much as they can in the summer. In the winter things are very quiet and some places shut for January. Not many people commute to Inverness as it’s at least an hour away, but quite a few people commute into Ullapool from Achiltibhuie and Dundonnel. Like many places in the Highlands the biggest job opportunities are for qualified tradesmen like plumbers or electricians. Wages are low but the quality of life is high. HM: I know you are an outdoor person - do you find the North West’s climate difficult? Do you get frustrated with rain and dark winters, or does being so close to the places you do sport make up for that? Actually I don’t have much problem there. I like to do a lot of different things which I can fit around the seasons and weather. Because I work part time in the winter, I see a lot more daylight than I would with a 9-5 job in the city. Also, although you can get some bad spells the weather is often not as bad as people in the central belt might think. Honest. HM: If you had another choice for where to move to in the Highlands and Islands, where would it be and why? Lochaber was somewhere I considered, because of greater range of job opportunities, but I think I made the right decision. HM: Any other comments/observations on living in Ullapool or advice for others thinking about moving? The biggest problem with moving to Ullapool is finding somewhere to stay, especially during the summer. Renting and buying are difficult, as many places are only let as holiday accommodation and the housing market is very small. Things are slowly improving with more housing being built, but the villagers get really frustrated when new houses are snapped up for holiday homes at inflated prices. the roads in the winter.